With kale chips being all the rage these days, and being that they are very expensive for a tiny little package, I thought it would be fun to try my hand at making them at home. Further impetus was that I just happen to have an Excalibur dehydrator that doesn't get very much use these days which was purchased for my brief flirtation being a raw foodist a number of years ago. When I went to select my kale in the produce department of the Whole Foods Market where I work, not only did the kale look amazing, but the mustard greens were even more beautiful. I thought to myself, "Hmmm... mildly spicy and peppery tasting. Why wouldn't they make great veggie chips as well?" I decided upon purchasing kale and the mustard greens as an experiment, and I am so glad that I did. Mustard greens may be hard to find, but if they happen to be in season, I recommend giving them a try along with the kale. I decided to take these to a party that my friend's were throwing. Since I had a busy week ahead, I knew that I would not have time to make something the day of the party. I made a big batch the week before, and then placed them in a large acrylic cambro with a tight fitting lid. I saved the silica packets from my empty vitamin jars to throw in the bottom of the cambro to keep the chips nice and dry. The chips were a favorite at the party. Not only did they make a nice presentation on the table, but they were easy to transport, and there was nothing to do but set them on the table at the party. I set the cambro lid below the container on the bottom as a base (so I wouldn't lose track of the lid) and at the end of the evening when leaving the party, all I had to do was pick up my empty container. Easy peasy! Every last crumb was devoured by both the children and the adults. 1. Make sure to wash your greens really well. I am always amazed at how much dirt is left in the bottom of the water bath that I rinse them in. I fill up my clean sink with the greens and completely submerge them to make sure that all of the soil comes loose. Then I spread them out on flour sack towels to dry them properly. The greens will need to be dried well for the cashew paste to adhere well to the leaves. 2. Prep your greens by tearing pieces of the leaf away from the tough green stem that runs down the center of the leaf. Tear the leaves into large pieces. 3. 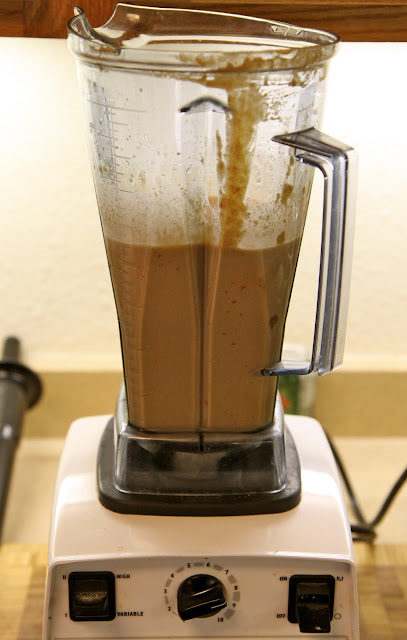 Place coarsely chopped red bell pepper in the bottom of your Vitamix or blender. Add the cashew pieces to the top of that. Pour in the lemon juice. Blend ingredients and begin pouring in the water slowly. You want the sauce to be thick enough so that it will coat the leaves in a nice even layer. 4. Pour the mixture into a large bowl and stir in the parmesan (if making a vegan recipe you will add sea salt to taste instead), brewer's yeast and black pepper. One you have tasted your mixture and have adjusted the seasoning you are ready to mix your greens with the batter. If you feel the batter is too thick, add a little water. Your are now ready to add your prepped leaves to the bowl. Toss well in the cashew batter and then lay the leaves on your dehydrator trays. You will need to use every other tray in the dehydrator, because the leaves are fluffy and need extra space. Remove the extra trays. I dry my chips at about 125 degrees for 2 days. Your drying times may vary depending on the temperature you choose and your relative humidity. 5. Once the chips are completely dry (they will be crispy), place them carefully in an air tight container. They are ready to enjoy.